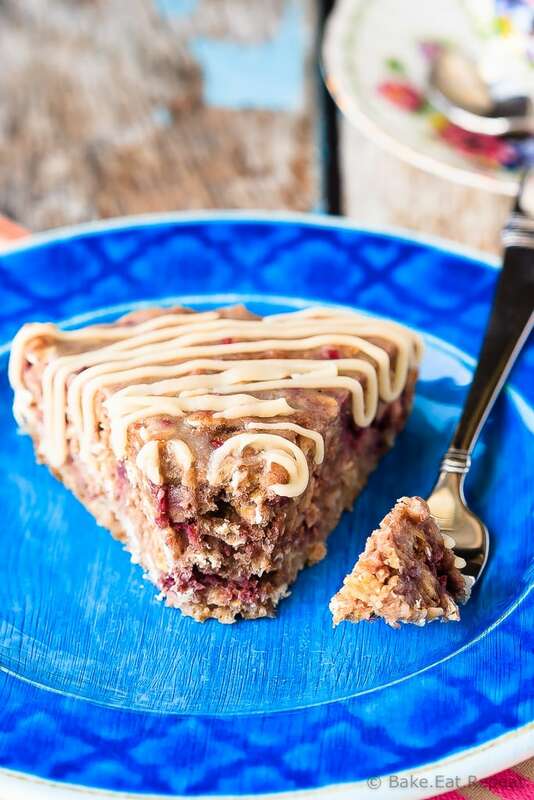 This banana berry oatmeal cake with a vanilla glaze is quick and easy to whip up, and makes a fantastic breakfast or a healthy snack! 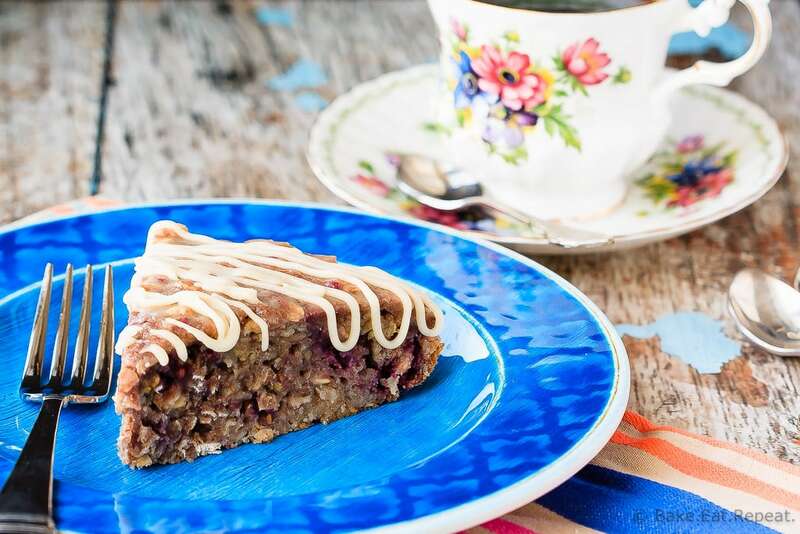 Banana berry oatmeal cake for breakfast anyone? Yeah, the title of “cake” is maybe a little misleading. It’s probably not really a cake, but it looked like a cake. And I couldn’t really call it oatmeal bars when it’s cut in wedges. Could I? So I didn’t really know what else to call this. Plus, it’s always kind of fun when you can have cake for breakfast. It’s not a decadent chocolate cake or anything, but then, would you really want that for breakfast? I love my chocolate and all, but even I would draw the line there. Unless it’s brunch. I don’t really have an issue with chocolate for dessert after brunch. Why is that? It feels weird to have dessert for breakfast – unless it’s after brunch, or in the form of a pastry. If you just sat down with a piece of chocolate cake for breakfast with your coffee it would be weird. But a chocolate croissant? Totally fine. Am I the only one that finds that strange? I’m okay with it – I’ll have a chocolate pastry any day, but it’s still kind of bizarre. Anyhow. Got a little off track there. Oatmeal cake. That’s what we’re here to talk about today. Banana berry oatmeal cake. And even if it’s not really cake, it’s pretty fantastic. 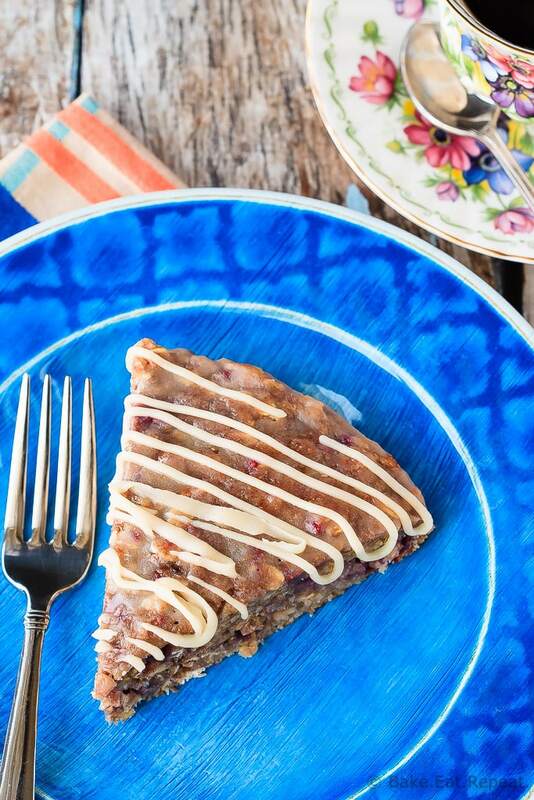 It’s a healthy baked oatmeal “cake” filled with bananas and raspberries and drizzled with a vanilla glaze. Served warm the glaze soaks into the cake and makes for a wonderful baked oatmeal treat for breakfast. I’m not a giant fan of oatmeal in the “regular bowl of oatmeal” form, but this kind of oatmeal I quite like. It’s hearty and filling and just sweet enough to feel like a treat, even though it’s definitely healthy enough to be breakfast. Plus it’s easy to make and the whole family will love it. And who doesn’t like cake for breakfast? the glaze is totally optional – but tasty! I’ve also shared this Banana Berry Oatmeal Cake recipe over on Food Fanatic. I'm always up for cake for breakfast. This looks so moist and tender. Looks so good! Could you use frozen blueberries? Yes, frozen blueberries would work just as well, I will probably use those next time I make it! Hope you like it!